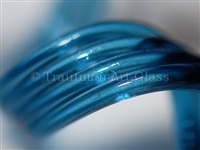 This is a transparent aventurine sapphire blue with big, glittery dichro-like sparkles. Great for layering. In the images you can see a pair of marbles featuring the Blue Stardust over Pink Cadillac (TAG-033-18) and over Super Canary (TAG-033-22, temporarily out of production.) The usual cautions against long, hot garaging technically apply since this is an aventurine colour, however it is highly stable in implosions, encasements, and virtually any application.